The Cuban Conundrum - by Christine Armario for the Associated Press has posted the following story. 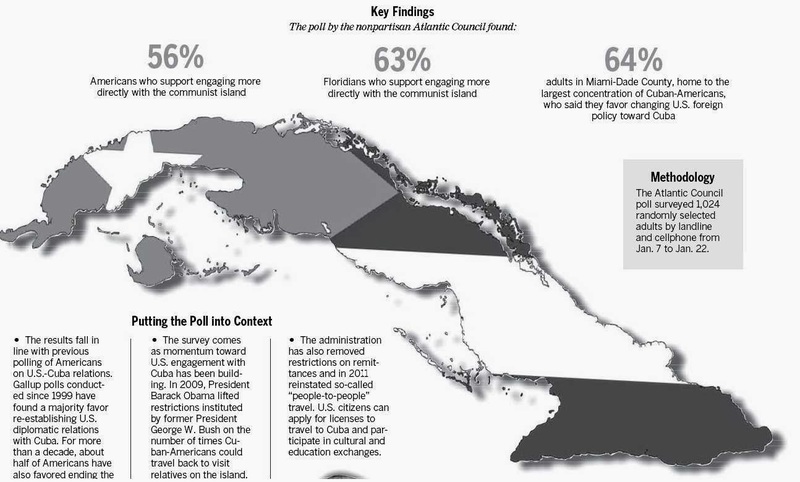 MIAMI (AP) — A majority of Americans and even higher proportion of Floridians support re-establishing relations with Cuba, Washington's Cold War-era foe that remains blocked behind a five-decade economic embargo, results from a poll released Tuesday show. The Daytona Beach News Journal posted a graph of the poll on February 16, 2014. It may be from it, as it does not appear connected to the AP story per se. Ms. Armorio often posts Associated Press Stories about Cuba and U.S. relations with it. Cuban-American Exiles Shifting in Policy View?